Woodrite is a high quality timber garage door manufacturer offering standard and purpose made side hinged and one piece up and over timber garage doors. The range is the largest standard range of designs with a choice of cedarwood and Idigbo as standard with a limited but beautiful oak timber door range. Based in Brackley, Northamptonshire, the factory takes care and pride in their timber products with traditional and modern construction techniques for the up and over doors and traditional side hinged timber doors in all shapes and sizes. Bespoke designs can be priced as required if one of the standard designs is not suitable. Woodrite builds their timber doors using 2 distinct methods - Panel build or Solid build. Panel-build is an excellent way of making a timber garage door panel by mounting the timber sections into a steel box section chassis or onto an aluminium sub-frame which provides the overall garage door panel with its strength. 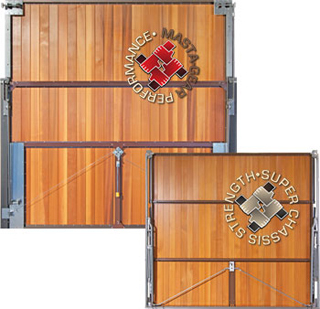 Panel-build garage doors are available with Super-Chassis lifting gear or Masta-Gear lifting gear. The timber door panel cloaks the chassis or sub-frame edges so from the front you will see edge-to-edge timber with no visible chassis, a feature unique to Woodrite. The Somerset, Buckingham and Warwick door ranges are all panel-build. Panel builds also give the option of the steel sub fixing frame. Solid-build uses traditional joinery methods to create a solid, all timber door panel that, apart from on very large garage doors, requires no chassis or sub-frame to provide its overall strength. Solid-build garage doors are available with Masta-Gear lifting gear which is attached directly to the timber door panel. From the front, solid-build garage doors have deeper edge rails, solid profiles front to back and a beautiful rounded chamfer detailing. From the back they look just as good - edge to edge timber. The Balmoral and Warwick door ranges are solid-build. With these 2 different build methods comes the option of the mechanism for the door panel. Super-Chassis is a lightweight operating gear suitable for all but the largest panel-build garage doors from the Somerset and Buckingham ranges. It features a strong corrosion protected steel chassis into which the lifting gear is integrated. Super-Chassis is available in retractable (single and double size doors) or canopy action (single size doors only). Retractable gear is straight arm as standard with the option of cranked arms for extra drive through width at wing mirror height on single sized garage doors. Super-Chassis timber framed garage doors have edge-to-edge timber all round, garage doors with a steel frame have edge-to-edge timber at the bottom and sides and a steel top edge that acts as a slam strip, closing concealed behind the frame head. The strong steel chassis sits behind the door panel. The top edge slam strip on doors with a steel frame is concealed behind the frame head when closed. 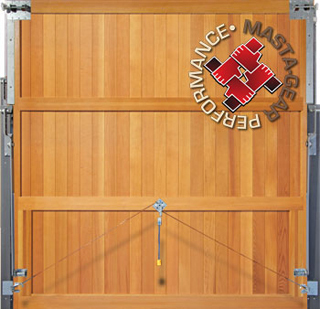 Masta-Gear is a do-it-all operating gear, suitable for all the timber garage doors in all sizes. Masta-Gear fixes to an aluminium sub-frame for panel-build garage doors and directly onto the timber panel for solid-build garage doors. It is available in retractable (single and double size doors) or canopy action (single size garage doors only). 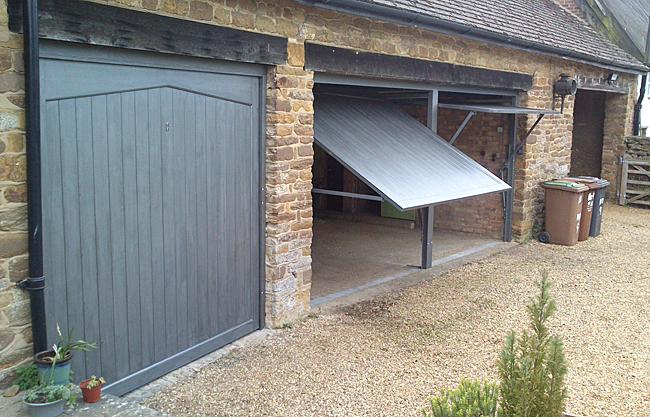 Single size retractable garage doors feature cranked lifting arms for increased drive-through width at wing mirror height when the door is open. The heavier duty straight arm version is fitted to double garage doors and the heaviest solid-build doors at the top end of the single garage door sizes.